(Nanowerk Spotlight) Some 5,000 years ago, the megalomaniac rulers of Egypt built themselves the mothers of all tombstones - pyramids. Pyramids are the largest monuments constructed by mankind (by the way, the largest of them all, the Great Pyramid of Cholula in Mexico, has an estimated volume of 4.45 million cubic meters; which makes it almost one third larger than the Great Pyramid of Giza in Egypt; the Giza pyramid is taller, though). On the other end of the size spectrum, down to earth scientists in Germany have built some of the smallest pyramids - they are only a few hundred nanometers tall. Like their big brothers in the Arabian desert the nanopyramids' purpose is to 'entomb' something. 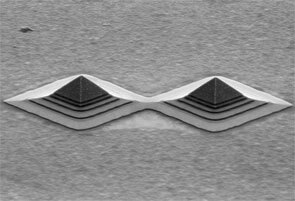 Designed to work as a new class of microcavity optical resonator, these structures rely on internal reflection of light waves from the tilted pyramid facets to achieve strong confinement of light in all three spatial dimensions with low loss. Where the Egyptian pyramids were supposed to be a place of ascendance for the pharaoh buried inside, the German nanopyramids are 'temporary resting places' for light, giving raise to quantum optical phenomena that could provide the basis for future quantum computers. Scientists' special interest in optical resonators is based on possible applications in quantum information processing and the development of single photon emitters. It has been known for quite some time that the interaction of electromagnetic radiation and quantum dots (QDs) can be increased when the latter are enclosed in a microcavity. As an alternative to common pillar-type resonators usually used for this purpose the German researchers suggest pyramidal microcavities. "Microcavities with quantum dots (QDs) are considered to be promising elements for quantum information processing, since they enable strong light-matter interaction which can be used for the entanglement of quantum bits in the QDs and a controlled interaction between spatially separated QDs" Dr. Michael Hetterich explains to Nanowerk. "We fabricated new types of semiconductor-based optical resonators using a combination of molecular beam epitaxy (MBE) growth, electron-beam lithography (EBL) structuring, and wet chemical etching. The main motivation for us to develop and study this new type of resonator is that it should – after further optimization – enable an improved coupling of single quantum dot electronic states with the light field." Hetterich, a researcher at the University of Karlsruhe, is one of the founding members of the university's Center for Functional Nanostructures. Together with Prof. Heinz Kalt's group and further collaborators within the CFN and at the university he investigated pyramidal gallium arsenide (GaAs) structures as candidates for true three-dimensional cavities with potentially low mode volume and high quality-factor ("Optical modes in pyramidal GaAs microcavities"). "Our nanopyramids could be interesting for the realization of single photon sources ('photons on demand'), using an optical fiber brought close to the pyramid tip (or one of the facets) to couple the photons out" says Hetterich. "However, our main aim is to use connected cavities (pyramidal or pillar resonators) to couple spatially separated quantum dot states via the light field in the context of possible future quantum information processing." The electronic states Hetterich and his colleagues have in mind are spin states, because they turn out to be very robust and should therefore be a good choice to represent quantum bits (qubits). "For that reason we also investigate the electrical initialization of spin qubits in quantum dots" he says. "Indeed, we could recently demonstrate electrical spin injection into single quantum dots with close to 100% efficiency" (see for instance: "Electrical spin injection into InGa(N)As quantum structures and single InGaAs quantum dots" and "Parallel preparation of highly spin-polarized electrons in single InAs/GaAs quantum dots"). The team in Karlsruhe has shown that by using EBL and suitable wet-chemical etching techniques both single as well as laterally and vertically coupled pyramidal cavities can be fabricated with good reproducibility. The resonators are formed by a bottom GaAs/AlAs Bragg mirror and the facets of the pyramids, acting as a kind of retro-reflector. A Bragg mirror (also called distributed Bragg reflector) is a structure which consists of an alternating sequence of layers of two different optical materials. Basically, all reflected components from the interfaces interfere constructively, which results in a strong reflection. Hetterich explains that the pyramid facet angles can be controlled by the composition of the etching solution. InGaAs quantum dots within the resonators are used as a broad-band light source to investigate the mode structure of the cavities by micro-photoluminescence measurements. The technique applied to fabricate the resonators has – in this particular way – not been used for this purpose before. The coupled structure types are also new. In contrast to other fabrication techniques like dry etching, wet-chemical etching should lead to reduced structural damage and thus improved Q factors of the resonators. Hetterich points out that the lower symmetry of pyramidal resonators compared to, e.g., pillar cavities leads to a higher number of spectrally close non-degenerate resonant modes that can be used to optically couple quantum-dot states. "The modes can be tailored taking advantage of the flexibility of the pyramidal structures, e.g. by changing the facet angle" he says. 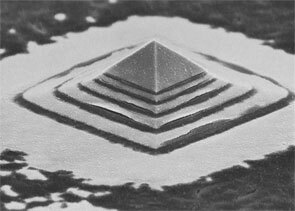 "Another advantage of pyramidal resonators is the fact that by depositing highly reflective mirrors on the pyramid facets, very high Q factors (required for quantum-optical applications) should become possible." "The results prove that resonant modes indeed exist in these structures" says Hetterich. "Although the quality (Q) factor of the cavities initially was very low (approx. 300) due to surface roughness scattering we were recently able to improve this value to approx. 600." The researchers are very confident that after further optimization very high Q factors combined with a low mode volume should become possible with this approach. That holds in particular for structures where the pyramid facets are also covered with a high-reflectivity metallic, dielectric or semiconductor Bragg mirror, i.e. for true 3D resonators with strong confinement in all directions. Such resonators should be very promising for quantum-optical applications says Hetterich. The main challenge for the Karlsruhe team will now be to realize resonators with sufficiently high Q factor to achieve a coherent coupling between different quantum dot (spin) states via the light field. This is the crucial ingredient in their approach to realize spin-based quantum information processing.